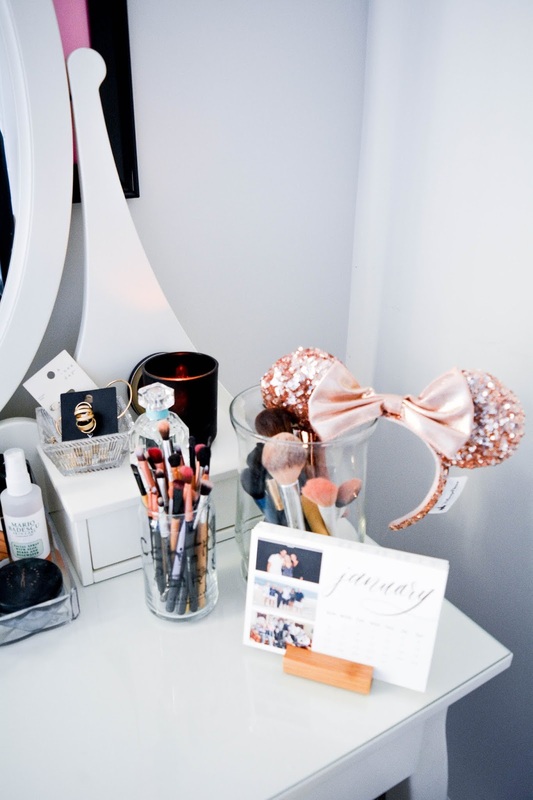 I showed you all what was inside my vanity back when I lived in Jacksonville, North Carolina, but it's been a couple years now and my style has changed. I started 2019 off with huge de-clutter in our apartment. Omar and I went through every nook and cranny in the apartment and if we haven't used it in the past six months to a year it went to a donation pile. 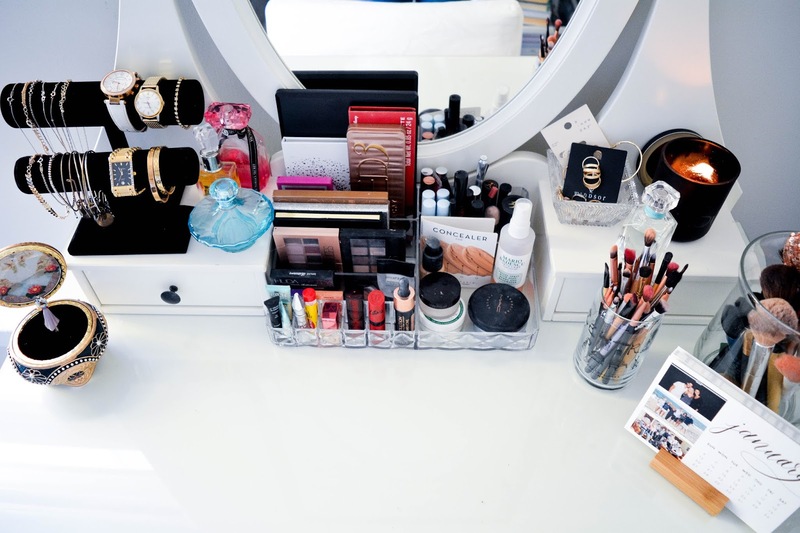 That included my vanity. I have makeup and jewelry that hasn't seen the light of day in a while and it was time to give it up. 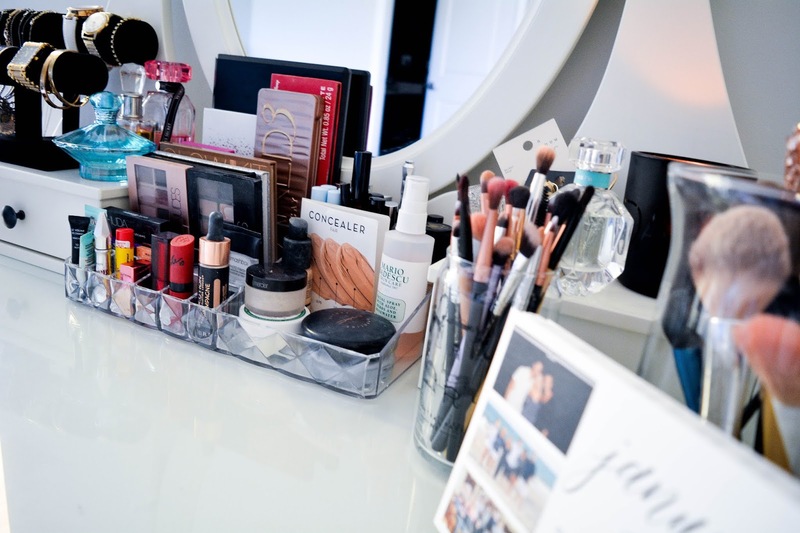 Now that my vanity is perfection, I wanted to share an update of what it looks like and how it's organized. 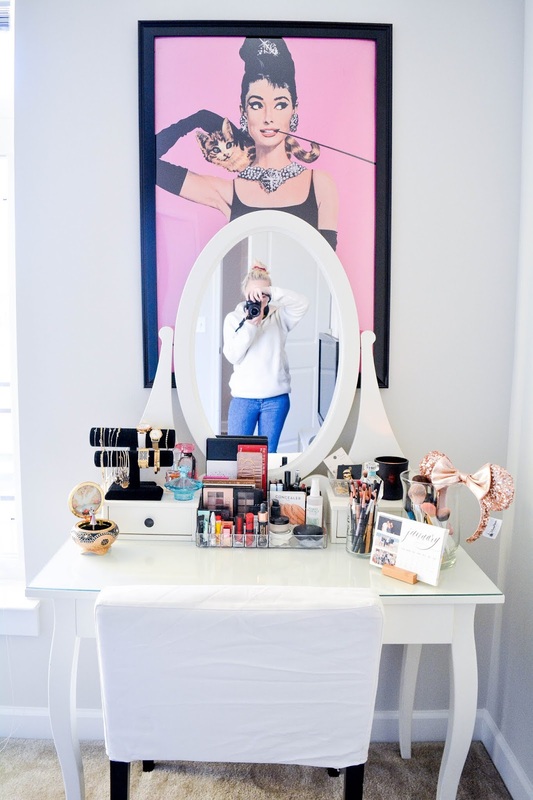 The vanity itself is from Ikea and it has been with my to three different living spaces. Honestly, I'm a little scared that it might not make it one more move, but it works for now and I love it just as much as I did the day I got it. Starting from left to right, not much of the layout has changed but the pieces on it definitely has. The black velvet jewelry organizers hold all (that's right all) of my necklaces, bracelets and watches. 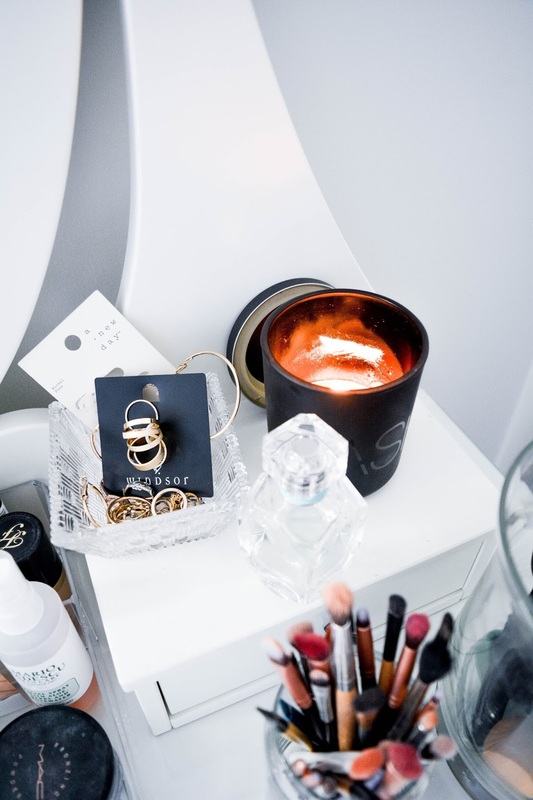 I wanted to take a minimalist approach when cleaning out my space and that included jewelry. I even donated some high end jewelry that I haven't worn in a long, long time. Some of my favorite pieces that I wear almost daily are my nameplate necklace, Kendra Scott Elsa necklace, Cartier Love Bangle, Gucci bangle and my gold diamond tennis bracelet. 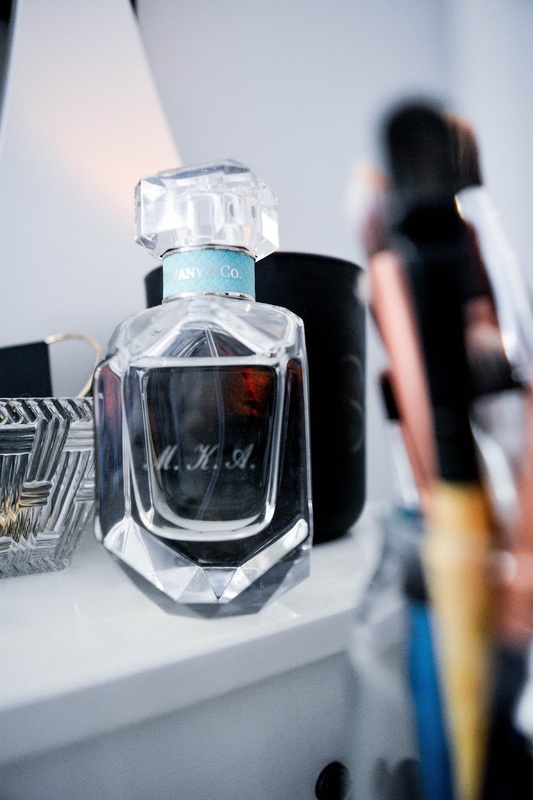 Next to my jewelry organizers are my bottles of perfume; Juicy Couture Viva La Juicy , Britney Spears Curious and Victoria Secret Bombshell. 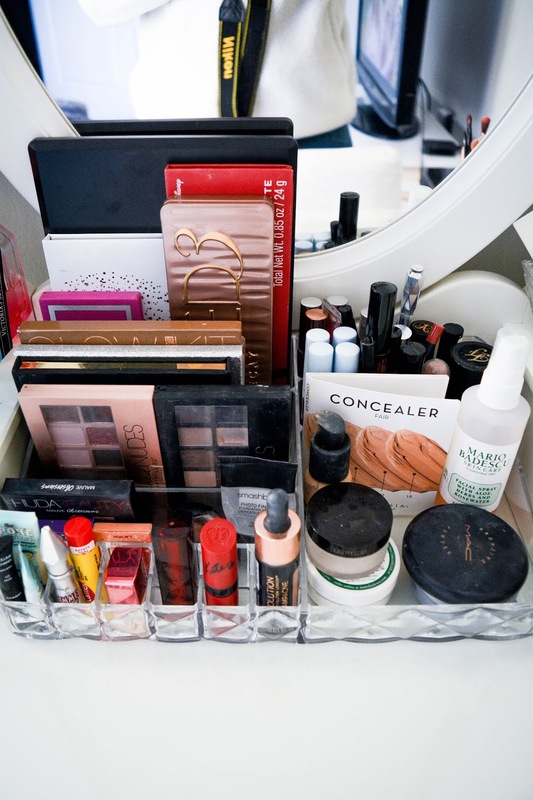 The center part of my vanity is an acrylic makeup organizer. 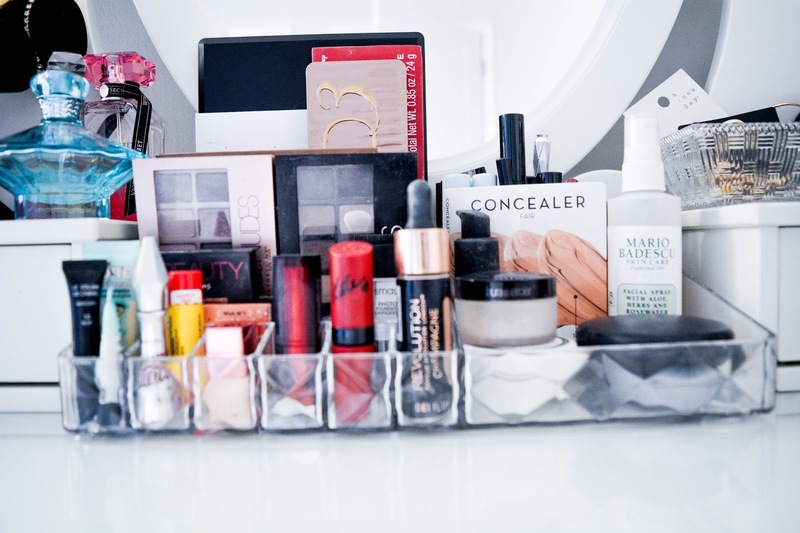 It contains all 99.9% of my makeup. I got rid of a lot of makeup that was either old or just taking up space and made room for new products that I got for Christmas. 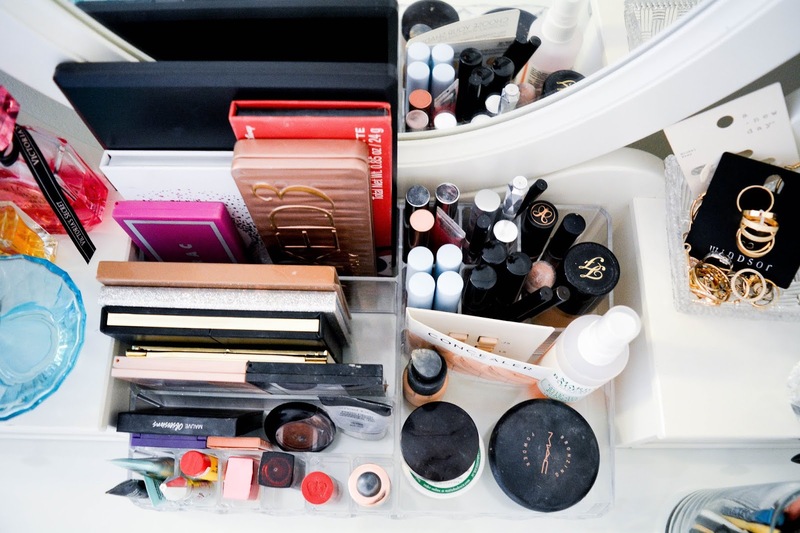 Now all of my foundations, powders, eyeshadows and lip products have a specific place to go. I listed all of the products that you see in these pictures down below. On the right side of my vanity is a small, crystal Tiffany & Co. bowl where I keep my earrings and rings. I don't wear a lot of earrings, despite the fact that I have eight ear piercings, but it's because I have to wear "real" metals (nothing plated/coated) or else I get an allergic reaction. So my gold Swarovski studs are my go-to earrings. These stainless steel hoops from Target are great for a night out and then there are my rings; Cartier Love Ring, Coordinate Ring and Gucci band are the ones I reach for the most. Next to that is my DASH candle from the DASH store in New York. I rarely burn this because I love, but it's a great decor piece for my vanity. Lastly, I have the Tiffany & Co. Perfume that Omar got me for my birthday. I have this standing on it's own because it's personally engraved with my monogram on it! 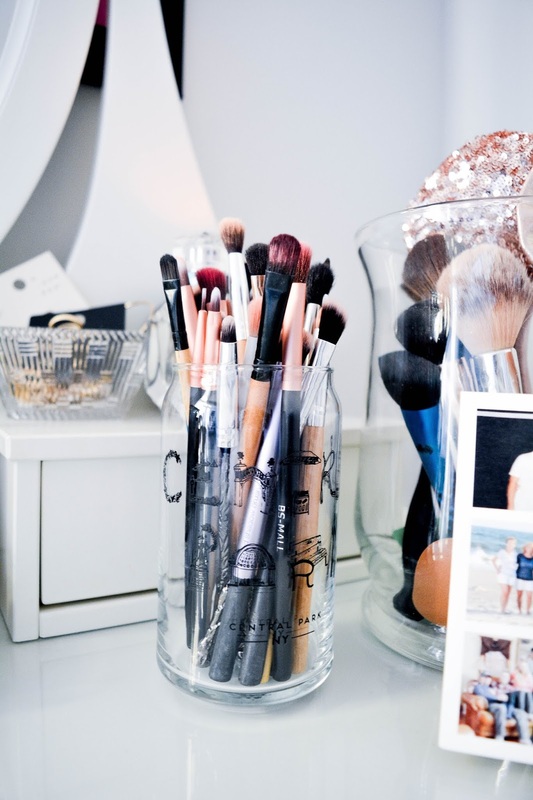 I have two glass holders for my makeup brushes and beauty blenders. The large one is a glass vase from a Marshall's and the other one is actually a candle I got at Urban Outfitters in New York City. Once I burned out the candle, I cleaned it out and re-purposed it. 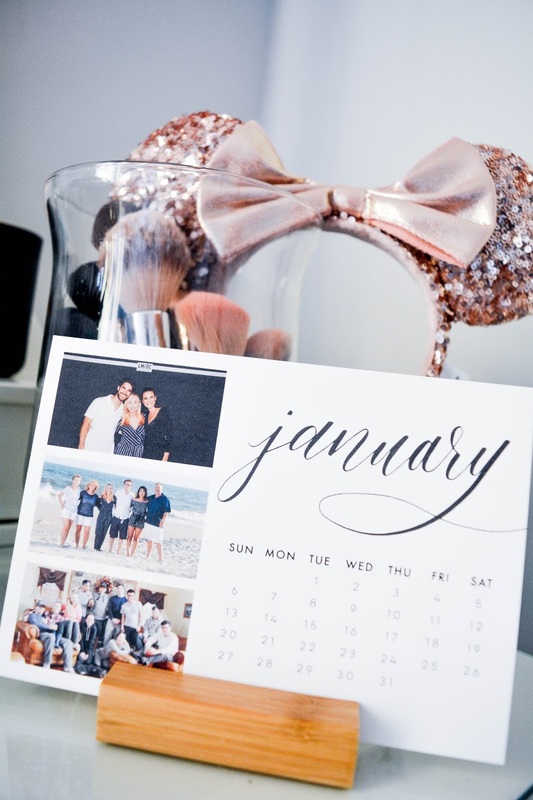 I also have my rose-gold Minnie Mouse ears that I got from Disney on my vanity. I usually wear it when I'm dong my makeup to keep my hair pushed back and I feel super cute like I'm back at Disney! 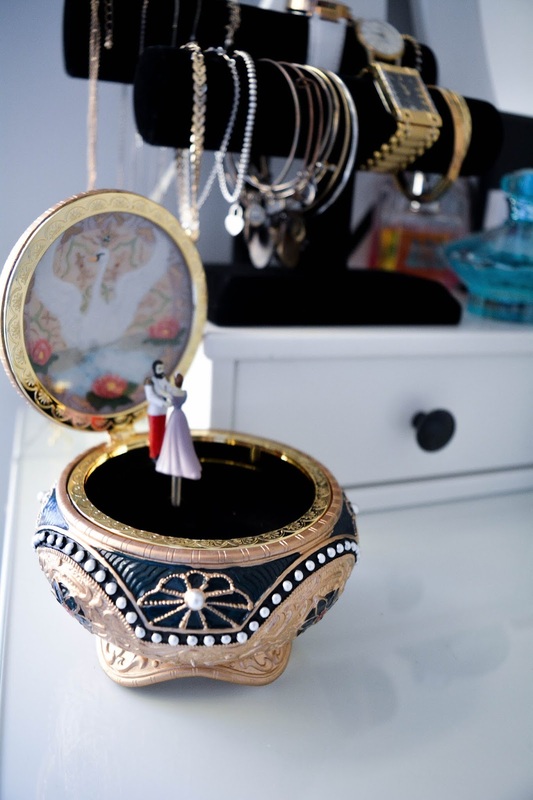 One of my favorite pieces on my vanity is the Anastasia Music Box that my brother and his girlfriend, Ana, got me for Christmas. I love this piece because it's so unique, I can throw jewelry in there at the end of the night and it's from my favorite princess movie! In the pull-out drawer I have just a few things. On the left side I keep hand sanitizers and lotions, a couple pocket mirrors and travel sized items. In the middle I have nail polish and a couple extra products as a back-up. 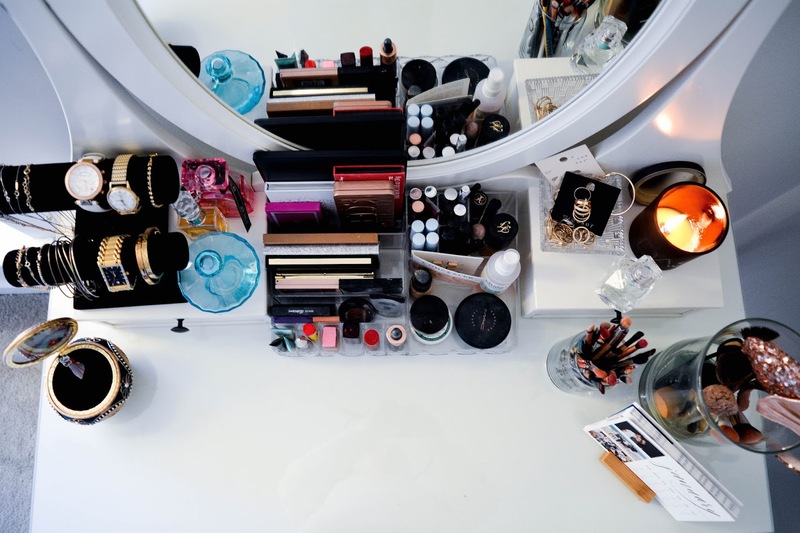 On the right side I have makeup, glasses and jewelry cleaner. In the drawers to the left (under the jewelry holder) I keep a couple extra pieces of jewelry that are specific for Disney or the beach. In the drawer to the right (under the crystal bowl) I keep spare sunglasses. The chair is from Ikea, but I don't think they sell it anymore. It sort of looks like this one but with arm rest. The amazing Audrey Hepburn 'Breakfast at Tiffany's' poster was a gift from my friend John for Secret Santa a few years ago. That's it! That's my entire updated vanity collection. I hope you see some pieces that you like, I'll have everything linked down below!